This page covers the author of The King in Yellow. For other authors named Robert W. Chambers, see the disambiguation page. Robert W. Chambers (2) has been aliased into Robert William Chambers. Works have been aliased into Robert William Chambers. Every second Friday of the month at 7.30 pm we, the English speaking clientele of the Otherland Bookshop, meet to discuss a selected science fiction, fantasy or horror book and enjoy snacks and drinks in our favourite bookstore. If you, too, enjoy reading speculative fiction and you're interested, you're more than welcome to join us! No registration required, just drop in. Check out the Otherlander's Blog for further information, including all dates and current books as well as reviews of all the books we've read. Come join our crypt-keepers, Joe and Steven, every third Tuesday of the month with our horrific book club, The Nightmare Factory. This month's book is The King in Yellow by Robert Chambers. "Robert W. Chambers" is composed of at least 3 distinct authors, divided by their works. You can edit the division. 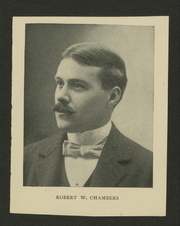 Robert W. Chambers is composed of 3 names. You can examine and separate out names.